Lying at the crossroads between Europe and Asia, east of the Ural mountains, Yekaterinburg was founded in 1723 by Tsar Peter the Great, who named it after his wife Catherine I. Described as “the window on Asia”, the city was one of Russia’s first industrial hubs, prompted by its rich mines and abundant natural resources, including precious minerals. 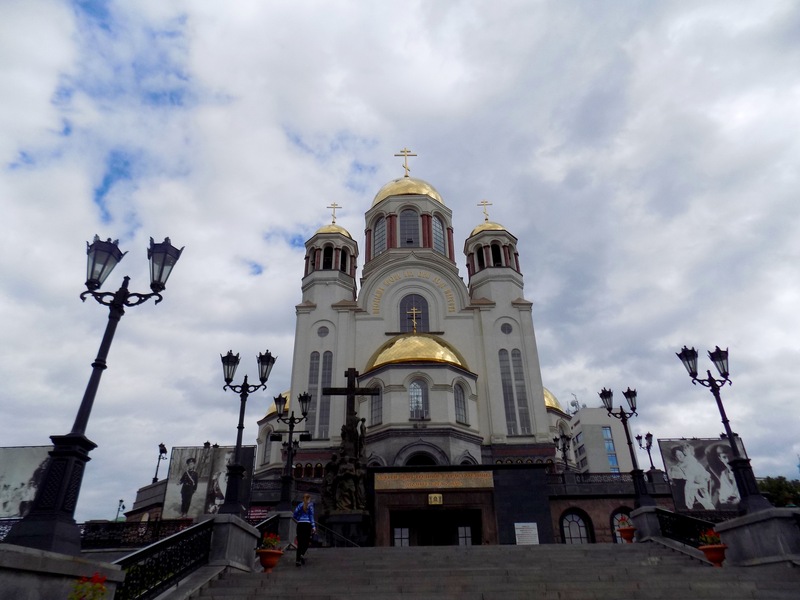 Yekaterinburg is also the place were the Russian monarchy came to and end for good, as Tsar Nikolay II and his family were assassinated by the Bolsheviks in the Ipatiev House on July 16, 1918. Another dramatic episode took place on May 1, 1950, when an American U2 spy plane was hit by a missile launched from the local military base, and, in order to defend its strategic industries, the city was closed and kept sealed from the world until 1990. In 1924, its name was changed to Sverdlovsk, in honor or the revolutionary leader Jakob Sverdlov, and restored to its original one only after the fall of the USSR. Well, first of all, if you’re coming straight from Moscow and your plan is to go directly to the Baikal, hell, you might need to stop in Yekaterinburg just for your own sake and avoid going crazy on a 4-day long train ride. 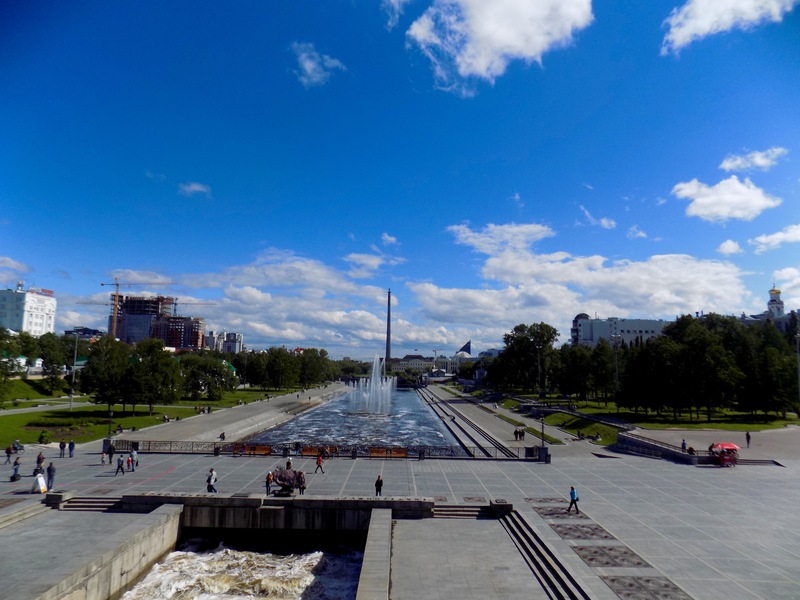 Yekaterinburg represents a good option for breaking down your trip, it may actually be worth the (quick) stop. It’s the 4th biggest city in Russia and it’s growing fast as you’ll find all sorts of tall modern-ish buildings and blah blah blah.. yeah, not that anybody is actually interested in this stuff apart from the Russians with their love for big shiny things… BUT: Yekaterinburg does lay in an interesting position, right at the gates to Asia, and no, you can’t actually see the Ural Mountains, but it’s nice to know that they’re somewhere over there and say “okay, bye bye Europe”. Plus, there’s a couple of Border Monuments where you can stop and take funny pictures to add some pathos to the trip. Second, it is the place where the legendary Romanovs Assassination took place, and, I hate to break it to you and ruin the epic escape story but yes, princess Anastasia did die there too, and you can actually see her tombstone, together with that of the other family members, inside of the Church on the Blood. If you like history and want to know more about the murders, check this link. Third… well, I don’t know if you’re into geology, but Yekaterinburg and the Ural region in general is famous for its precious minerals and gems, and even if you’re not into geology, it might be nice to buy yourself a nice green malachite souvenir or bring it has a present for someone. It’s also quite cheap so, why not. Yekaterinburg has a wide network of buses, minivans, trolleybuses and most importantly a subway that has three relatively short but useful lines. Coming in by train, you’ll arrive at Yekaterinburg-Passazhirsky Station and the closest metro stop is Ural’skaya, on the green line. If you need to go to the “city centre”, take that line, direction Botanicheskaya. Map of the Metro here. The Church on the Blood and the Romanovs Assassination Site. Ipatiev House, the original location of the murders, was demolished by order of President Yeltsin, for fear of gatherings of monarchists, and later between 2000 and 2003, the Church on the Blood was build on top of it, to commemorate the Romanovs. It’s located near Dinamo Metro station. The City Dam on the Iset River. It’s were the factory-city was founded and is now surrounded by a fairly nice pedestrian area. Near it you can also find the City Founders Monument, representing Vassiky Tatishev and Willem Hennin, who were also known as the “Fledging of Peter’s nest” as they established the city in 1723 as a metallurgical plan by the order of Peter the Great. 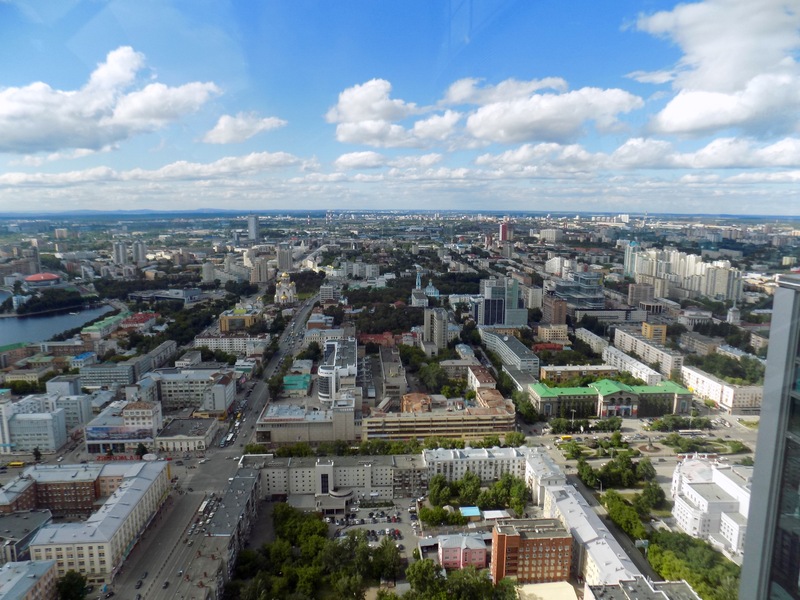 Panorama view from the Visotsky Building. This business centre has some 53 floors and a terrace from where you can get a view of the entire city. It ain’t the Empire State Building, but still worth a visit. Europe-Asia Border Monument. 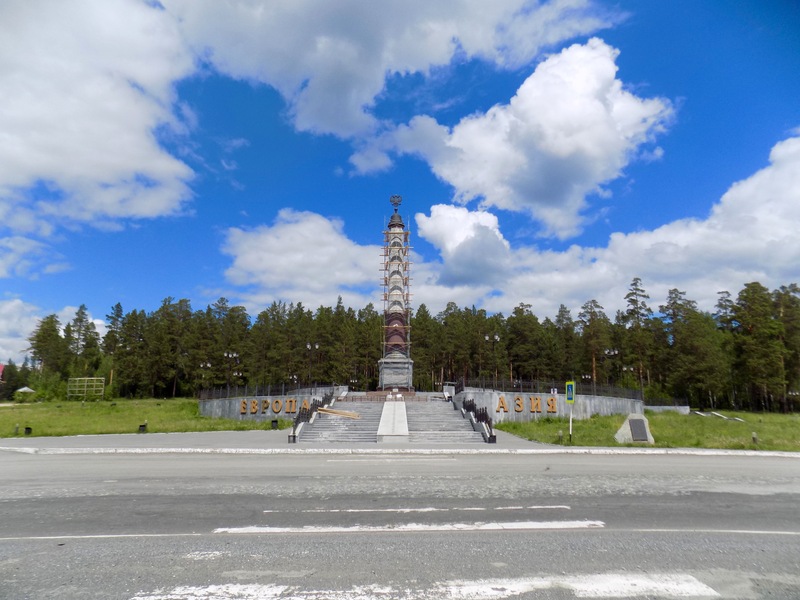 There are two Europe-Asia border monuments, the Old one and the New one, both located along the same highway, the “New Moskovsky tract”. The New Border Monument lies some 17 Km away from the city, beside the highway road. It is relatively small, with a white line separating the East and the West. The basement of the monument consists of two stones, one from the extreme westpoint of Europe, at Cape Roca of Portugal, and the other at the extreme eastpoint of Asia, Cape Dezhnev of Russia. As for the old Europe-Asia border, it lies 47 Km away from Yekaterinburg, near the small village of Pervouralsk. This is definitely bigger and was erected in 1837 to commemorate a visit by Tsar Aleksander II, who is said to have stopped there and opened a bottle of wine. This seem to have started a funny pastime by locals: drinking a glass of wine in Europe and another one in Asia. As if they needed the excuse. Anyway, the monument is immersed in nature, with tall pine trees all around it and a nice grassy area behind it, so it might be a nice a idea to pack your food and have lunch there. To reach it, you can take bus #150 from the Severny Bus Station to Pervouralsk, just remember to warn the driver to stop at the Monument, otherwise you’ll end up in a godforsaken village and, you don’t wanna end up there, unless you wanna experience the inner void and desolation of Russian utmost periphery. To head back to Yekaterinburg, just stand by the opposite side of the highway and wait for a bus to pick you up. I know, it seems shifty, but it works. Alternately, you can walk along the highway for about 1 km and you’ll get to Pervouralsk and find the local bus stop, but again, you don’t wanna do that. Others. Ganina Yama (Ganya’s pit), Ballet Opera House, and… that’s pretty much it. You can easily visit all this in one day. Sleep: we stayed at Dostoevsky Hostel, on Radisheva 33, podezd 4, floor 10, which was quite okay, very clean a cheap. Drink: Shtab Bar, ulitsa Malisheva 39. Cool, soviet-looking little place, drinks are really cheap and the atmosphere is awesome. It has a whole WWII theme going on and is full of locals.